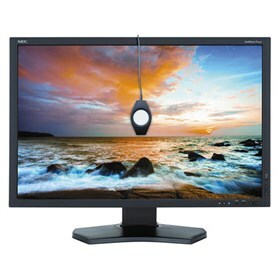 The NEC P242W-BK-SV is a 24" LED backlit IPS professional desktop monitor provided along with SpectraView II. The LED backlit IPS (in-plane switching) monitor features a high definition resolution of 1920 x 1200 for enhanced picture quality along with an 8ms response time. This monitor can be easily pluged into a variety of devices with a variety of inputs including DisplayPort, DVI-D, HDMI and VGA ports. The P242W-BK-SV features 178° horizontal and vertical viewing angles and brightness of 350cd/m2 with 1000:1 contrast ratio. This IPS monitor also comes equipped with SpectraView II, an advanced colorimeter based on the X-rite i1 Display Pro, delivering superlative color calibration tools to further enhance the color quality. The NEC P242W-BK-SV has many exciting features for users of all types. See the NEC P242W-BK-SV gallery images above for more product views. The NEC P242W-BK-SV is sold as a Brand New Unopened Item.